Most of us don’t think much about soil, let alone its health. But as Earth Day approaches, it’s time to recommend some skin care for Mother Nature. 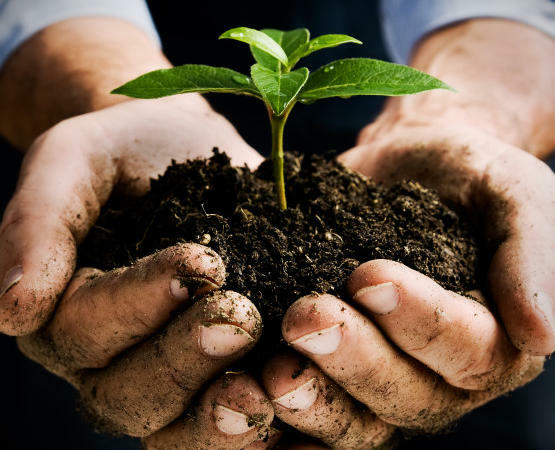 Restoring soil fertility is one of humanity’s best options for making progress on three daunting challenges: Feeding everyone, weathering climate change and conserving biodiversity. Widespread mechanization and adoption of chemical fertilizers and pesticides revolutionized agriculture. But it took a hidden toll on the soil. Farmers around the world have already degraded and abandoned one-third of the world’s cropland. In the United States, our soils have already lost about half of the organic matter content that helped make them fertile. What is at stake if we don’t reverse this trend? Impoverished trouble spots like Syria, Libya and Iraq are among the societies living with a legacy of degraded soil. And if the world keeps losing productive farmland, it will only make it harder to feed a growing global population. But it is possible to restore soil fertility, as I learned traveling the world to meet farmers who had adopted regenerative practices on large commercial and small subsistence farms while researching my new book, Growing A Revolution: Bringing Our Soil Back to Life. From Pennsylvania to the Dakotas and from Africa to Latin America, I saw compelling evidence of how a new way of farming can restore health to the soil, and do so remarkably fast. Workshop on cover crops, weed management and no-till practices at the Stark Ranch in Gainesville, Texas. 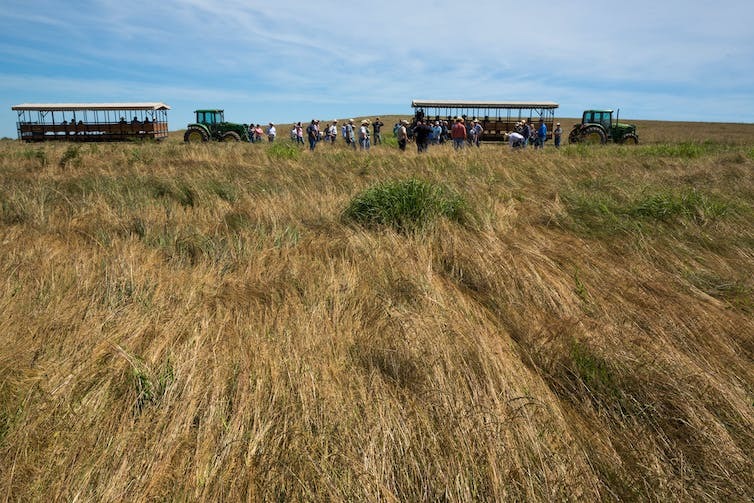 These farmers adopted practices that cultivate beneficial soil life. They stopped plowing and minimized ground disturbance. They planted cover crops, especially legumes, as well as commercial crops. And they didn’t just plant the same thing over and over again. Instead they planted a greater diversity of crops in more complex rotations. Combining these techniques cultivates a diversity of beneficial microbial and soil life that enhances nutrient cycling, increases soil organic matter, and improves soil structure and thereby reduces erosive runoff. Farmers who implemented all three techniques began regenerating fertile soil and after several years ended up with more money in their pocket. Crop yields and soil organic matter increased while their fuel, fertilizer, and pesticide use fell. Their fields consistently had more pollinators — butterflies and bees — than neighboring conventional farms. Using less insecticide and retaining native plants around their fields translated into more predatory species that managed insect pests. Innovative ranchers likewise showed me methods that left their soil better off. Cows on their farms grazed the way buffalo once did, concentrating in a small area for a short period followed by a long recovery time. This pattern stimulates plants to push sugary substances out of their roots. And this feeds soil life that in return provides the plants with things like growth-promoting hormones and mineral nutrients. Letting cows graze also builds soil organic matter by dispersing manure across the land, rather than concentrating it in feedlot sewage lagoons. 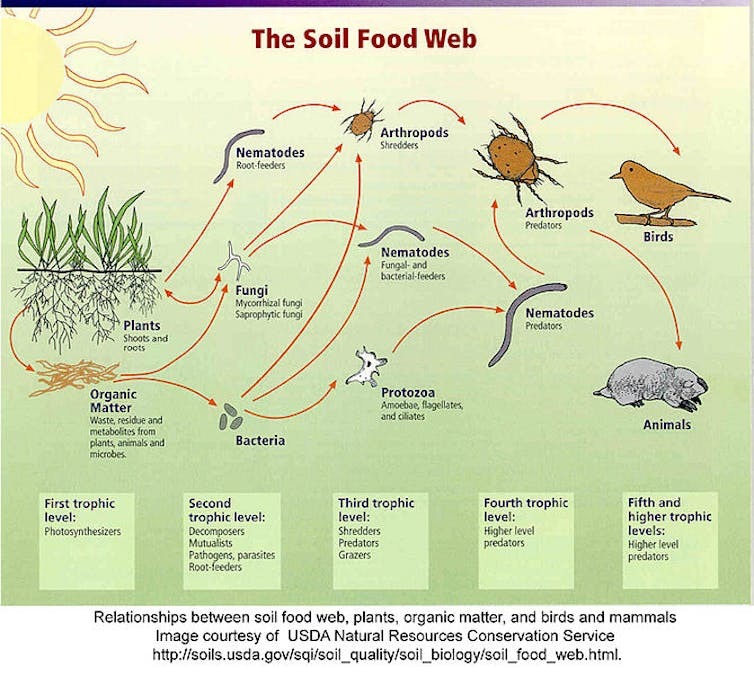 Soil organic matter is the foundation of the soil food web, and the consensus among scientists I talked with was that soil organic matter is the single best indicator of soil health. How much carbon could the world’s farmers and ranchers park underground through soil building practices that incorporate plant residue and stimulate microbial activity? Estimates vary widely, but farmers I visited had more than doubled the carbon content of their soil over a decade or two. If farmers around the world did this, it could help partially offset fossil fuel emissions for decades to come. Soil restoration will not solve world hunger, stop climate change, or prevent further loss of biodiversity. No single thing can solve these problems. But the innovative farmers I met showed me that adopting the full suite of conservation agriculture practices can provide a better livelihood and significant environmental benefits on conventional and organic farms alike. Restoring fertility to degraded agricultural soils is one of humanity’s most pressing and under-recognized natural infrastructure projects, and would pay dividends for generations to come. It’s time for a moonshot-like effort to restore the root of all prosperous civilizations: Our soil, the skin of the Earth.